We accept personal checks as a form of deposit ONLY. We no longer accept checks on the day of pick-up. ONLY CASH IS ACCEPTED ON THE DAY OF PICK UP. If you are using a personal check as a form of deposit, you must allow 10 days prior to pick-up of your pup/dog. We also accept: cash, money orders, or credit cards through PayPal (must add 4% if using PayPal and also must allow 3 business days prior to picking up your pup/dog). We schedule you, (in order of your "pick") to come pick out / up your new pup the 1st day after they are 6 weeks old and have had their vaccinations and checked by our vet. We will not hold a puppy unless it has a $250 deposit placed on it. After the pups receive their first vaccinations, we will contact you to schedule (in order of your pick) a day and time to come and "pick out" your puppy. If the buyer is unable to make a pick in person, we can send photos and allow the buyer to make their choice via email photos and phone conversations. If the buyer cannot make their choice within a reasonable amount of time the seller allows, the buyer will then forfeit that position of pick to the next buyer. 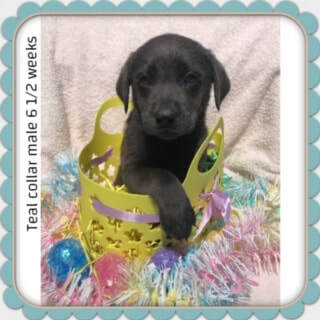 M & A Labrador Kennels, LLC reserves the right on EVERY litter to have 1st pick on ALL pups. Pups must be at least 6 weeks old and have their second vaccination before leaving **no exceptions**. If you are having a puppy shipped, the FAA requires that all pups be at least 8 weeks old to fly. If shipping a puppy, we will make special arrangements with the airline to get you the puppy. Additional charges for plane ticket, crating, proper vet certifications, vaccination requirements, micro-chipping etc., will apply and must be paid before we ship the puppy. The only way pups receive immunity to diseases and bacteria is through mother's milk. Pups can easily contract diseases and infections prior to vaccinations. Therefore, for the safety and health of our pups, we do not let anyone come to see pups until the pups have had their first vaccinations. NO EXCEPTIONS. Also, for the health and safety of our pets and yours, we DO NOT ALLOW anyone to bring their pets to "visit" or meet a potential new "family member" . At 4 weeks old, pups get their first vaccinations. After pups reach 7 weeks old, they should be ready for their new homes for those that are picking up in person. All pups that are scheduled to fly somewhere are required to be at least 8 weeks old. We reserve the right to hold a puppy longer than the age of 7 weeks old if we feel the puppy needs more time with littermates. If an entire litter is spoken for before the pups have reached 6 weeks of age, we wait until they are 7 weeks of age and let new puppy owners come and make their selections and take their pups home at that time. We DO NOT allow visitors to bring their pets to M & A Labrador Kennels, LLC, to reduce the possibility of disease, infection, viruses and parasites. Be sure to take a look at the Upcoming Litters page to see who is expecting. Periodically, we do have some adults that are available for new homes.